– 2016 started with a series of school holiday and vacation care puppet show performances. – The Richard Bell film I performed puppetry in (“5 for 35”) screened all Summer at GOMA as part of the 8th Asia Pacific Triennial of Contemporary Art (APT8). 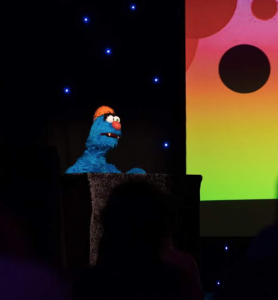 – I provided puppetry training (and puppets) for ImproMafia’s “Not 4 Kidz” at the Brisbane Comedy Festival. 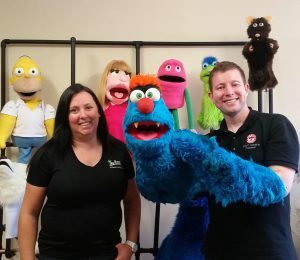 – A new puppet character, Frazzamatazz, joined the Larrikin Puppets cast in February. – I began sewing lessons in preparation for the puppet building component of the upcoming intensive puppetry course I was enrolled in at the University of North Texas. – I performed MC duties (hidden under a table – Troggg was the MC!) at the official Ipswich Festival media launch. Troggg got to introduce Mayor Paul Pisasale to the stage. I also performed puppet shows at the actual Ipswich Festival, and was informed by several friends in the lead up that they noticed big roadside billboards with Troggg on them! 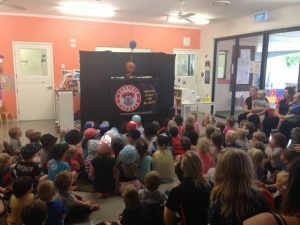 – I also performed puppet shows at the Paradise Resort in Surfers Paradise, the Redcliffe Sails Festival, a Bunnings store in Warwick, an Indian restaurant, a nursing home and several childcare centres, schools and birthday parties. – Elissa helped me run some puppetry workshops at a few schools, including a full week (three workshops a day) at Belmont State School. – We went down to Adelaide to visit Shannon Cooke at The Puppet Workshop. – We lived in Brooklyn, New York for three months. We saw lots of live theatre in NYC – including many puppet shows for adults, improv comedy and “Avenue Q” off Broadway (with a backstage tour thanks to puppeteer contacts). – Much of my time overseas was spent networking with other puppeteers, which included frequent visits to The Puppet Kitchen for monitor puppetry sessions run by the awesome Michael Schupbach. 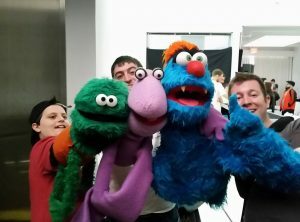 Between there, several puppet shows/events and a few Muppet screenings at the Museum of the Moving Image it was really great to meet, perform and practice with so many great NYC puppeteers and fellow Muppet fans – including Marcelo Bottaro, Arlee Chadwick, Musa ‘Fuzzy Beard’ Bradley, David Bizzaro, Zach ‘Wackiman’ Woliner, Nicola ‘Callie & Izzy’ McEldowney, John Papovitch, Kevin Hale, Tau ‘Being Elmo’ Bennett, Christina Rodriguez Stone, Matthew Soberman, Sam ‘Mo Monster’, Tania Lopez, Tim Young, Erin Finnegan, Spencer Cohen, and so many more amazing people! 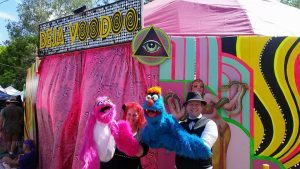 – I performed my full puppet show at the Puppetry Arts Festival of Brooklyn (yes, I transported my whole puppet stage and all the puppets to America). 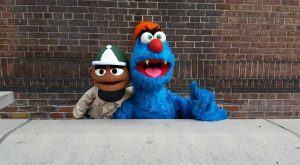 – Troggg guest starred in an episode of The Fuzzy Beard Show. 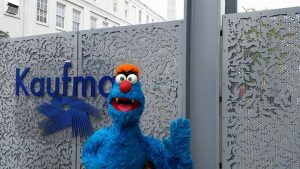 – We attended a convention called “Morning with the Muppets” starring Steve Whitmire (with Kermit the Frog), Eric Jacobson (with Fozzie Bear and Animal) and Peter Linz (assisting). I asked a couple of questions during the Q&A, and was lucky enough to have a brief chat with Steve Whitmire afterwards. He fluffed up Troggg’s fur as he spoke to me about a trip to Australia they were taking soon. – We spent a week in Los Angeles, staying just off Hollywood Boulevard. 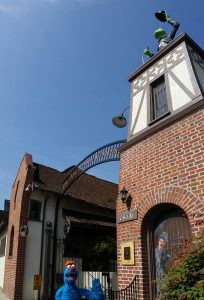 We walked to the Jim Henson Company and checked out the big Kermit statue out the front. 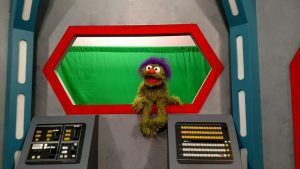 – We spent a day with Henson puppeteers Grant Baciocco (whom I’d met in Brisbane a couple of years earlier during “Puppet Up!” and stayed in contact with) and Russ Walko. Troggg of course came out on all of these puppet-related excursions in both New York and Los Angeles. – We spent a week in Denton, North Texas where, at the University of North Texas, I received advanced, intensive, life changing training in film & TV monitor puppetry from Henson puppeteers Marty Robinson (Telly Monster, Mr. Snuffleupagus) and Noel MacNeal (Bear in the Big Blue House), and a puppet construction component lead by Pasha Romanowski (Project Puppet, The Moe Show). Elissa came with me to all the casual nights of drinking and chatting with the puppeteers. She also attended the special performance night we did on the final day. The whole thing was an unforgettable experience. This kind of training simply doesn’t exist in Australia. I was so happy to not only get some of my existing skills validated, but also to learn so many valuable new skills, and better ways to perform my craft from the best in the business – my heroes! 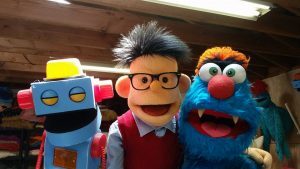 – Since returning to Australia, I performed both puppet characters in a short comedy film called “Kev”, plus shows at schools, childcare centres, festivals and parties every week! – There were more shows at the Gold Coast’s Paradise Resort, and even a few shows at New Farm Cinemas, which included some Larrikin Puppets cinema advertising before screenings of “Moana” and “Sing”. I even got to perform my first puppet show at the famous Brisbane Powerhouse! – And we spent the final week of the year performing three shows a day, every day at one of Australia’s biggest festivals – the Woodford Folk Festival. It’s been an absolutely huge year! Here’s to more puppet fun in 2017! 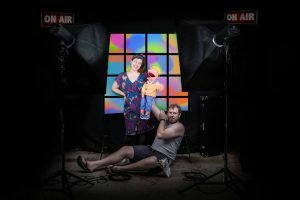 This entry was posted in 2016, 5 for 35, Bear in the Big Blue House, Belmont, Beyond the Sock, birthday parties, Bribie Island, Brisbane, Brisbane Powerhouse, Broadway, Brooklyn, Burbank, California, child care centres, childcare centres, children's entertainment, Comedy, De Ja Voodoo, Denton, Eric Jacobson, festivals, Film, Fozzie Bear, Frazzamatazz, Fuzzy Beard, Gelato the Genie, Grant Baciocco, Henson, Hollywood, Hollywood Boulevard, Improv, Ipswich, Ipswich Festival, Jim Henson, JJ Byrne Park, JJ Byrne Playground, John Papovitch, Kaufman Astoria Studios, Kermit the Frog, Kev, KevShortFilm, kids' entertainment, Larrikin Puppets, Larrikin Puppets News, Los Angeles, Manhattan, Martin P. Robinson, Marty Robinson, Mayor Paul Pisasale, Michael Schupbach, Milo J. Monster-Smith, Mo Monster, Morning with The Muppets, Muppets, Museum of the Moving Image, New York, New York City, Noel MacNeal, North Texas, Not 4 Kidz, NYC, Off Broadway, Paradise Resort, Pasha Romanowski, Peter Linz, Project Puppet, public puppet shows, puppet builder, Puppet MC, Puppet Shows, Puppeteer, puppeteer course, Puppetry, Puppetry Arts Festival of Brooklyn, puppetry workshops, QLD, Queens, Queensland, Richard Bell, Russ Walko, Saturday Morning Media, Sesame Street, Shannon Cooke, South Australia, Stage Shows, Stanley & JAX, Staten Island, Staten Island Ferry, Steve Whitmire, Surfers Paradise, Tau Bennett, Team Lopez, Telly Monster, Texas, The Fuzzy Beard Show, The Jim Henson Company, The Mo Show, The Moe Show, The Muppet Show, The Muppets, The Puppet Garage, The Puppet Kitchen, The Puppet Workshop, The Space Cowboy, The Ultimate Nerd-ament, The Ultimate Nerd-ament with Stanley & JAX, Theatre, Toiley T. Paper, Toiley T. Paper - Roll Model!, Troggg, Troggg the MC, Uncle Interloper, University of North Texas, USA, Vulture Festival, Wally Wackiman, Warwick, Woodford, Woodford 2016, Woodford Folk Festival, Woodford Folk Festival 2016, WoodfordFF, Woodfordia, workshop, workshops, Zach Woliner, Zoe L'Amore by Brett. Bookmark the permalink.